Poolsafe’s automatic swimming pool safety covers provide first-rate performance. We have several options to accommodate many pool designs. Our team has innovated new ways to use our product to securely cover unique, existing, and new pool styles. In addition to installing retractable pool safety covers, we also repair all makes and models of automatic pool cover mechanisms. When it comes to pool safety covers. We can help if you’re trying to replace an old system or having a new pool built. For new and remodeled pools, our under track model is ideal to install while it’s still under construction. Once finished, it will be out of sight and unobtrusive to swimmers. The under track model is available for regular rectangular and elaborately designed pools. Homeowners may also chose this option to protect their spa. While there are important factors to consider when covering a vanishing edge pool, our method and product has been proven over years to be the most effective and reliable. Generally speaking, this option is only possible during new construction. In the event that a pool owner wants a more custom appearance but cannot build the track into the structure of their pool, our flush track model is a good option. Recessing the track so it is flush with the surface of the deck give a refined appearance. If the pool is existing, the deck would have to be prepared to receive our track. Existing pools can have an automatic pool cover as long as the pool deck is one level, we can install our tracks creating a rectangle surrounding the pool, and there are no obstructions inside of the rectangle (like waterfalls, diving boards, etc.). Some obstacles can be removed or changed to allow for the pool cover. As an independent distributor, we have aligned ourselves with the best manufacturer in the world to ensure that our customers get the best. We have installed and worked on pool covers for over 30 years so we have seen it all. Colors (from left to right): Navy Blue, Royal Blue, Light Blue, Green, Brown, Beige, Gray, Charcoal. … and the list goes on. For more details, ask to speak with one of our Safety Consultants. 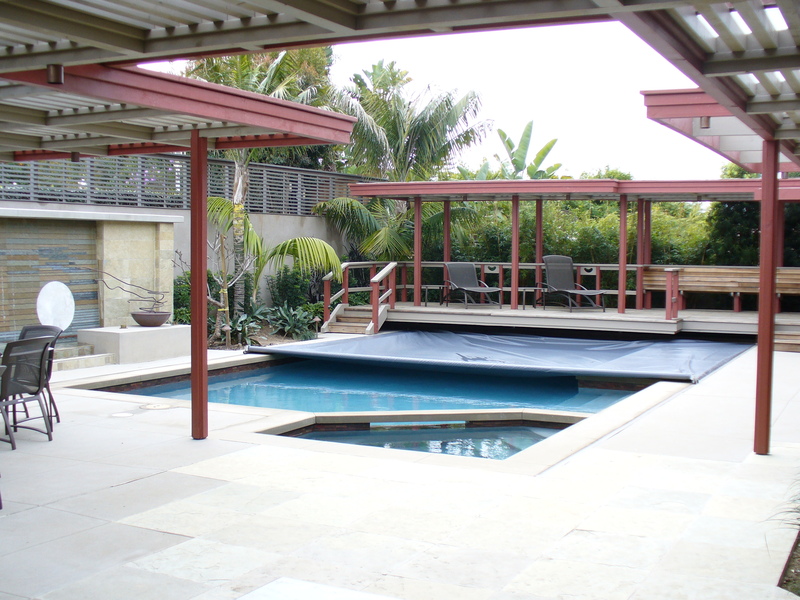 An automatic pool cover uses special edging to connect the pool cover and track system. Our edging is thicker, stronger, and more flexible, which is visibly noticeable when examined in person. Special inhibitors protect it from pool chemical and UV. We even provide color-matched edging for improved appearance rather than white edging traditionally provided. Traditional edging is known to prematurely dry, fray, split, and create service needs. Our edging has virtually eliminated edging repairs. Our lowest shrink rate fabric provides a long lasting, high performing fabric that will look good and allow for proper function for years of use. Our vinyl is poured, not laminated, which means that there is no glue holding layers of fabric together. In other words, laminated vinyl could fail prematurely if the glue is compromised but our vinyl does not use glue in construction. Most homeowners purchase a pool cover system for safety reasons, but there are other benefits that come with every installation. Our products provide the widest range of practical benefits that makes pool maintenance much easier. Safe, durable, and efficient – an automatic pool cover just makes sense. Call us today or fill out the Contact Us form to schedule a free consultation. Poolsafe automatic pools comply with ASTM and UL standards, as well as social services and relevant building codes. It completely seals the pool, so that children and pets wouldn’t be attracted by the lure of the water. In one click, you’ll be able to close the pool in 30 to 60 seconds. Without the drudgery of a manual cover, you’ll be able to enjoy your pool even more. Our vinyl cover helps keep yard debris from getting in the pool. You’ll be able to save on electricity, and reduce pool equipment run-time by 70%. The water treatment will also last longer without debris and prolonged sun exposure. An automatic pool cover helps retain heat (as much as 8 to 12 degrees) making it easier and more efficient to achieve and maintain the desired water temperature, which means you’ll cut down on energy costs too. You’ll save up to 70% on pool chemicals cost because a vinyl pool cover prevents evaporation. This also means elimination of water loss; you not only save money on your water bill, but also contribute to preserving the precious resource. Every fabric we make uses 18 ounce coated vinyl and the thickest vinyl available industry-wide. Many fabrics today are made with 16 ounce coated vinyl, but we will make your replacement fabric with our “upgraded” vinyl at no additional charge to you. Our replacement fabrics come with hybrid webbing that is thicker, stronger, and more flexible than standard pool cover edging (webbing). And our edging is color matched with the fabric color for improved aesthetics. We use rope that has a track record of outlasting standard pool cover rope, which has been a problem for many manufacturers. Our rope, called Invis-A-Rope, is dark gray so it blends into tracks for a nicer appearance. No matter what manufacturer made your original cover, we will have APC make your replacement cover with these cutting edge components so it can last longer and work better than previous. 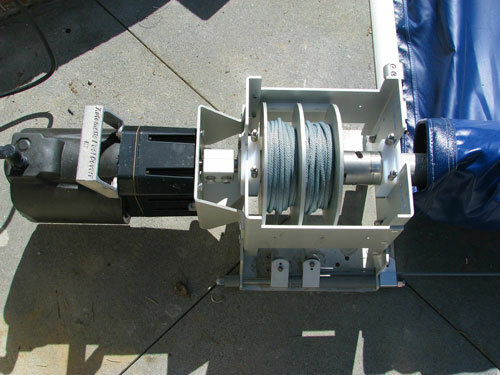 Our mechanism uses an electronic torque limiter based on patented technology to ensure the best protection for the automatic pool cover yet avoiding the regular maintenance of a system with sheer pins or mechanical torque limiter. Minor cover alignment discrepancies are not a problem for our system, which is designed to ensure complete opening and closing whereas other systems often run crooked. And, you certainly don’t ever have to touch the hardware to make operational adjustments like you would with older systems. The motor we use is completely sealed and injected with a “potting resin” to protect against water damage. Other motors were designed in such a way that leaves them vulnerable to water damage. We can even replace your old key switch or key-lockable switch with our touchpad that is more secure. You never have to worry about losing your key, breaking it, or accidentally leaving it in the switch, which is the most dangerous exposure.